"Sampath Speaking" - the thoughts of an Insurer from Thiruvallikkeni: French Railways SNFC orders 2000 trains ~ that are too wide for Stations !! French Railways SNFC orders 2000 trains ~ that are too wide for Stations !! A travel by train is always worth of savouring ~ a train journey was worth its length. The yester generations cherished travel by talking a lot during and later about the journey and the experiences during the travel. The most popular advice perhaps those days was not to sit near the window and look out when the train chugged out of station – for those days, engines were powered by coal and fine coal dust would be in the air and could fall in eyes. Often we hear people saying that in foreign countries, trains are so good – very much on time, neat, and more …. SNCF (Société Nationale des Chemins de fer Français) is France's national state-owned railway company. The SNCF operates the country's national rail services, including the TGV, France's high-speed rail network. The SNCF employs more than 180,000 people in 120 countries across the globe. The railway network consists of about 32,000 km (20,000 mi) of route, of which 1,800 km (1,100 mi) are high-speed lines and 14,500 km (9,000 mi) electrified. About 14,000 trains are operated daily. Ouigo is a French low-cost train service between Marne-la-Vallée (near Paris) and the south east. It is a subsidiary of SNCF, but it is independently run from its parent company. In India, the State owned Indian Railways has more than 64015 km of tracks and 6909 stations, traversing the length and breadth of the country. Millions use this facility every day. From 1853, the Railways have come a long way. Going by the measure of distance between the tracks, there are gauges known as Broad gauge 1676mm; meter gauge 1000 mm as also on few hilly routes narrow gauge. There have been many interesting posts on how this gauge length was determined by the two horses that used to pull trains in earlier days ~ though it would make interesting read, may not be the truth…. 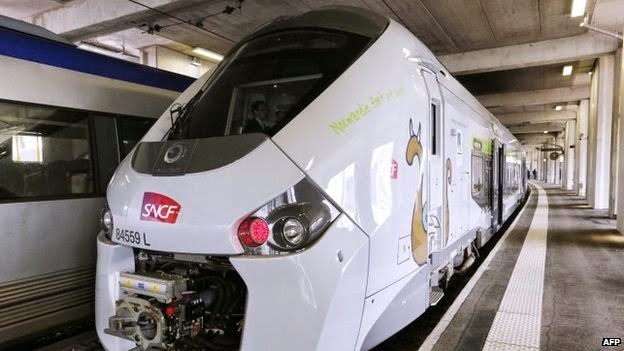 Now read this news too…… the French train operator SNCF has discovered that 2,000 new trains it ordered at a cost of 15bn euros ($20.5bn; £12.1bn) are too wide for many regional platforms. BBC reports that it is an embarrassing blunder that has so far cost the rail operator over 50m euros ($68.4m; £40.6m). Reuters report suggests that France's national rail company SNCF had ordered 2,000 trains for an expanded regional network that are too wide for many station platforms, entailing costly repairs. A spokesman for the RFF national rail operator confirmed the error, first reported by satirical weekly Canard Enchaine in its Wednesday edition. "We discovered the problem a bit late, we recognise that and we accept responsibility on that score," Christophe Piednoel told France Info radio. Construction work has already begun to reconfigure station platforms to give the new trains room to pass through, but hundreds more remain to be fixed, he added. 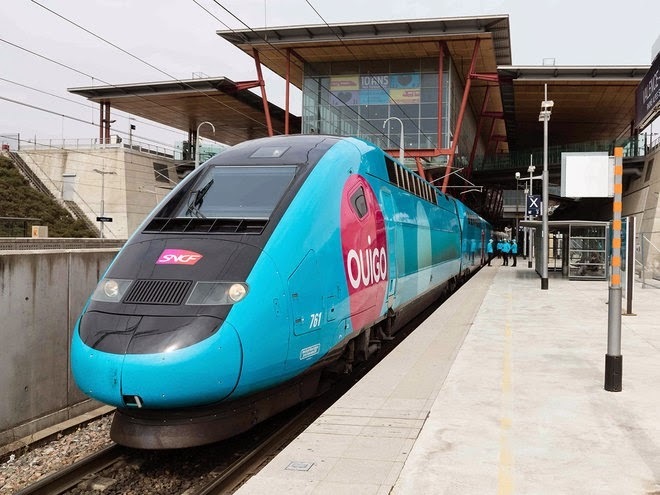 The mix-up arose when the RFF transmitted faulty dimensions for its train platforms to the SNCF, which was in charge of ordering trains as part of a broad modernisation effort, the Canard Enchaine reported. The RFF only gave the dimensions of platforms built less than 30 years ago, but most of France's 1,200 platforms were built more than 50 years ago ~ and that has necessitated the repair work costing million of euros. Transport Minister Frederic Cuvillier blamed an "absurd rail system" for the problem, referring to changes made by a previous government in 1997. "When you separate the rail operator (RFF) from the user, SNCF, it doesn't work," he told BFMTV. Some reports suggest that the cost is likely to rise even further as construction work has already started to reconfigure station platforms. The work will allow new trains room to pass through. But officials say that there are still 1,000 platforms to be adjusted. The platform edges are too close to the tracks in some stations which means the trains cannot get in, officials say. Is that the proverbial ‘communication gap’ and lack of coordination !